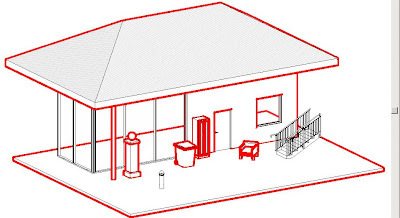 My day to day findings with Autodesk's Revit Architecture and associated BIM software. Bugs, fixes, workarounds, great finds, and best procedures. 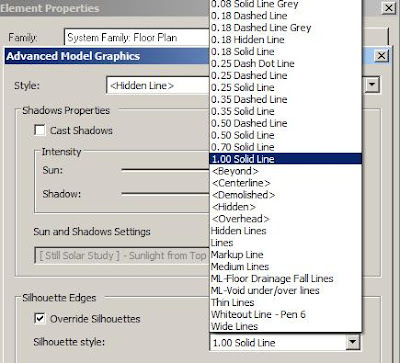 “Revit Architecture can automatically apply a line style to silhouette edges. Silhouette edges are view-specific. After you have applied silhouette edges to the model, there may be edges you do not want to display in silhouette. You can remove these lines as necessary”. What it fails to say is that the Silhouette function does not work on all Categories. It works fantastically on Roofs, Wall, Floors, Columns, Structure, Openings, Furniture, Casework, Generic Models, and Speciality Equipment, Site Elements. It does not work on Mullions, Curtain Panels, Stairs, Railings, Ramps, Lighting Fixtures, Mechanical or Electrical items. In the above graphic I've set the silhouette edges to Red in order to clearly see what is silhouetted. The big pain here is Curtain Mullions and panels. So, on your elevations you have to manually go around and Silhouette the mullions. I am a BIM Manager / Consultant working in Melbourne, Australia. Bridge of Peace - Exterior - The structure was built in Italy, after which 200 trucks were used to transport it to Tbilisi. 3D Printing - Update - Here is an update to my original post of exporting a Revit model to STL for 3D printing... Click here to download. More to follow shortly. BIM - BAM - BOOM - Patrick MacLeamy, FAIA – the CEO of HOK aka the father of the MacLeamy curve, discusses life after BIM. ABC3D Book - This is just too interesting not to share. Some gifted minds are just specially made to see objects and in this case typography in creative 3D.